We just can’t help ourselves. 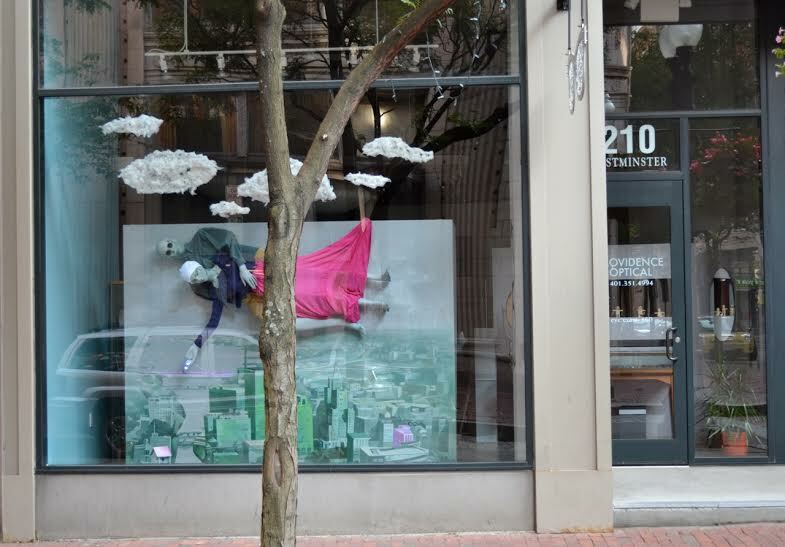 We had so much fun with our Magritte-inspired window that we had to feature another artist in our newest window display. This time we drew our inspiration from Belorussian-born French artist Marc Chagall (1887-1985). His work is the very essence of fantasy. He didn’t belong to any one artistic movement, but rather combined elements of cubism, symbolism, expressionism and surrealism into his own unique style. 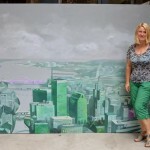 His paintings contain conventional elements like people, flowers, landscapes and buildings, but instead of copying a real scene, he constructed fantasy tableaus by combining elements that have an emotional connection. The people and objects in his works usually are placed in positions that defy the laws of nature and physics. 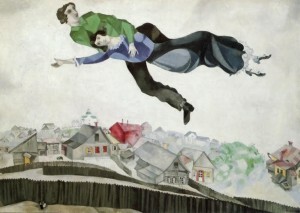 Such is the case with the couple floating above the landscape in Chagall’s painting “The Love Story” (or “Over the Town” is another name), which is the inspiration for our latest display. We confess that we took some liberties to make it our own. 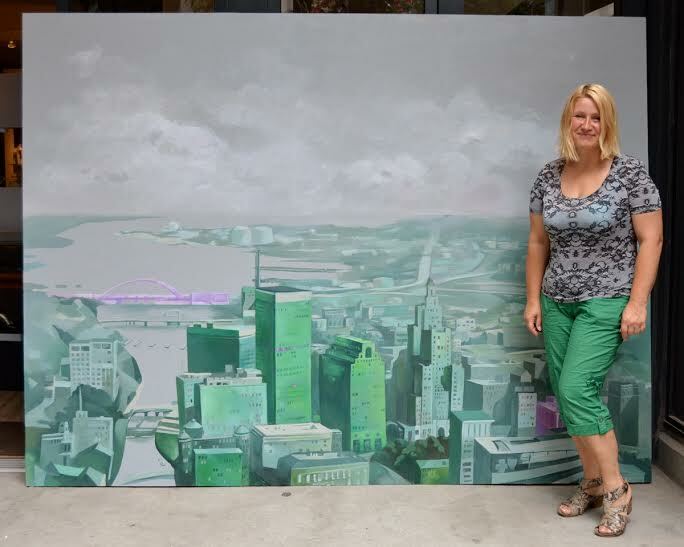 With help from artist friend Ieva Liepina, from Riga, Latvia, we created a cityscape of Providence to replace the rural landscape in Chagall’s original. Our airborne lovers look a lot like his, but we gave them modern clothes, while keeping the flowing lines and romantic style of the original – after all, they are lovers. Of course, there had to be eyeglasses involved, but we were very restrained. We chose round American Optical sunglasses for our male lover because of their timeless, classic appeal. Since we have the luxury of working in 3 dimensions, we echoed the clouds in the sky behind the lovers with fluffy puffs suspended over our lovers. 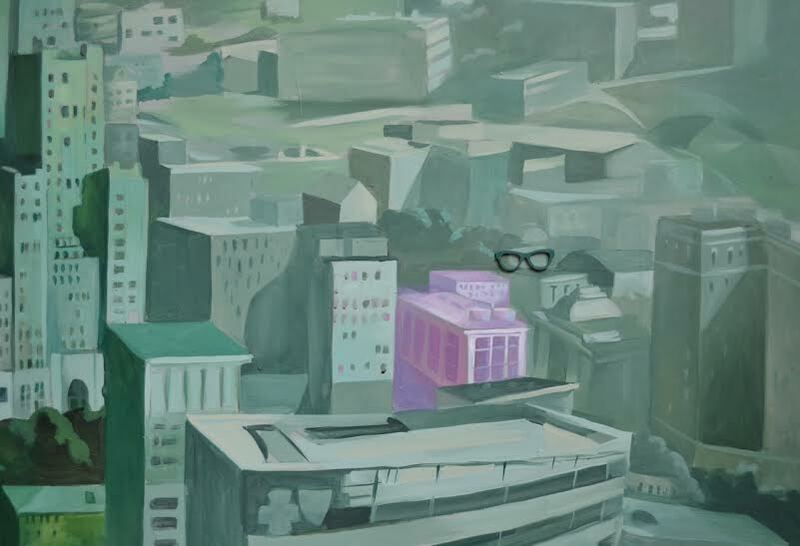 If you look closely, you’ll see in the background cityscape that we highlighted our building with brighter colors that make it look like the sun is shining on just that one spot, and we put a diminutive pair of eyeglasses above to identify it in a subtle way. If you have a good eye (pardon the pun) for detail, you’ll also see that we set a birdhouse in the foreground as a playful echo of the buildings in the cityscape, and to give our masterpiece a more 3-dimensional feel. It was a lot of work, but it was a labor of love. We hope you’ll stroll by and take a look. Better yet, poke your head in and tell us what you think of it. 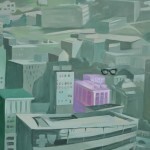 Posted in Fun Facts, Uncategorized	| Tagged Birdeye Providence, Chagall in Providence, Ieva Liepina's painting in USA, Painting of Providence, View of Providence from above, Ева Лиепина, Шагал "Над городом"